This is my version of Korean gyeran-jangjorim, which is traditionally a recipe where hardboiled eggs are braised in soy sauce. 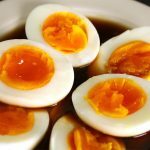 Braising involves cooking in soy sauce over low heat for a long time, but I prefer not to braise at all, and just make a delicious soy broth and pour it over the eggs before serving. I also prefer my eggs in gyeran-jangjorm to be between soft and hard boiled, where the whites are soft and the yolks are not totally solid either, but not runny. 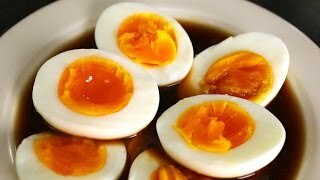 The final result is a creamy egg that goes well with the salty, savory, slightly spicy soy broth. It’s easy to make and goes well with rice or noodles, or just as a quick protein-rich snack. You can also make a big batch like I do, and keep them in a glass jar in the fridge for a week or so as you enjoy them. Good luck making gyeran-jangjorim! Let me know if you try this recipe, and upload a photo to my website if you do! Bring 5 cups of water to a boil over medium high heat. Add the vinegar and the eggs. Cover and let cook 1 minute, then stir with a wooden spoon so that the egg yolks will be set in the center. Cover and cook another 1 minute, then stir again. Cover and cook for 6 more minutes. If you use extra large sized eggs, cook a few minutes longer. Remove from the heat and strain in cold running water. Soak the eggs in cold water for 10 minutes. Pour out the water and shake the pan so that the egg shells crack. Open and add some cold water. You should now be able to shell the eggs easily and cleanly. You want to keep the eggs as round and beautiful as possible! Heat a sauce pan over medium high heat. Add the anchovies and stir with a wooden spoon for 2 minutes, until the anchovies turn a little light brown. Add garlic, onion, and jalapeño pepper, stirring for 1 minute. Add the water and the soy sauce. Cover and cook for 10 to 12 minutes over medium heat. Strain over a bowl and press down on the mixture in your strainer to get all the good, clear broth out of the ingredients. Let the broth cool down. To serve immediately, cut the eggs in half, put them in a shallow bowl, and pour the broth over top. Serve as a side dish. To save for later, but all the eggs and the broth in a glass jar and refrigerate up to a week. Posted on Sunday, March 8th, 2015 at 8:15 pm. Last updated on March 12, 2015. Posted October 1st, 2017 at 7:56 pm | Log in to reply. What a tip for egg cracking! Thank you! It`s really great! Posted June 15th, 2017 at 2:36 am | Log in to reply. Posted July 11th, 2016 at 7:21 pm | Log in to reply. This recipe was originally posted on March 8, 2015 at 8:15 pm by Maangchi. It was last updated on March 12, 2015. The video was watched 1,027,856 times on YouTube & has 14,223 likes!